I know, I’m a little early with the valentine cookies. But since I have no valentine this year (waah), I made cookies to share with my coworkers. And trust me when I say they’re not complaining they get to start stuffing their bellies a day early. I used my favorite sugar cookie and powdered sugar glaze recipes. Also, notice the cute X and O cookie cutters? I was cleaning out my cupboards and came across them–they were a gift from my mom last year which I almost forgot about! Unfortunately, I couldn’t do too many Xs and Os because they are huge and I would have ended up with only about a dozen cookies. And finally, totally unrelated, but if you got here via an article in your local newspaper (hi Judi, I tried to email you but it was returned), would you please send me a link or tell me the name of the paper? cute! 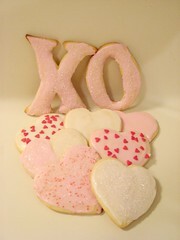 I am making V-day sugar cookies too. I baked up the cookies last night and am frosting them tonight. I made buttermilk cookies, so they are a little different than yours. I think I am going to use your glaze instead of the buttercream I was planning because I need to transport them and I think that will hold up better. Those X and O cookie cutters are adorable. I was going to make some of my own but I have issues with frosting sometimes. But yours turned out fantastic! Those looks so amazing, wow. Does the icing harden fast, and can you keep the cookies for a long time in an air tight containter? The glaze set relatively quickly. By the time I had done my dishes and put everything away, I was able to stack the cookies in a container. And because I’m paranoid, I put a piece of parchment between each layer.